Colchester, a city in modern Essex, in Eastern England seems an unlikely candidate for King Arthur's capital, yet it has strong claims to being the original Camelot. The Connection: Colchester was one of the most important Iron Age settlements in Britain, Capital of the major pre-Roman power, King Cunobelin of the Catuvellauni and the Trinovantes. After the Roman invasion, it was established as a Colonia for retired military officers and the city retained this high status throughout the four centuries of Roman Rule. Its name was Camulodunum. Modern Archaeology: Though there is little evidence to support the theory, Colchester is generally supposed to have been the centre of some kind of British Kingdom during the early 5th century. Early Anglian finds from North-East Essex are comparatively rare and there is some evidence for Celtic survival in the city. A few late Roman houses in Stockwell Street may have continued in use into the Dark Ages, whilst the find of an elaborate Germanic buckle may indicate the employment of foreign mercenaries to defend the town. Its name, Camulodunum, derives from an ancient Celtic War-God and means "Camulos' Fort". Possible Conclusions: It seems probable that Camelot, Chrétien De Troyes' name for Arthur's Court, is derived directly from Camelod-unum, the name of Roman Colchester. The East Coast town was probably well-known to this French poet, though whether he knew of any specific associations with Arthur is unclear. Medieval legend recalls Camulos through the supposed pagan King Camaalis after whom the town was said to have been named. John Morris suggests that Camulodunum might actually have been the High-King Arthur's Eastern Capital. It was highly accessible, near to important contacts on the continent and close enough to the Saxon centres of East Anglia and Kent to cause them considerable trouble. 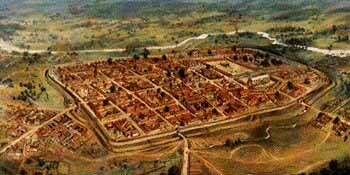 While trade declined, so did Londinium (London). Camulodunum flourished however, though probably not for long.